There are so many ancient references to tauromachy, the ritual killing of a bull, that one could say people have been bull fighting forever. When we say "bull fighting," however, we don't mean the Mithraic Mysteries or the Epic of Gilgamesh; we mean the blood sport associated with Spain and some places in the Americas. Bull fighting apparently started in eighth-century Spain as a spectacle in which a man on horseback would confront the animal. (At least plausibly, the affair was a ritualized descendant of the above-mentioned ancient practice of bull sacrifice.) It survived in that form for some centuries and was very popular among the noble classes in Spain until 1567, when Pope Pius V issued a Papal bull (make up your own joke!) against man-vs.-beast sports. The ban was revoked by the next Pope and bull-fighting later developed into the form we know —man on foot against the beast; the first bull fight of that nature was in Spain in the early 1720s. It is still very popular in that nation but is forbidden in many other European countries. It never occurred to me that there had ever been a bull fight in Naples. Yes, Naples was ruled by the Spanish from 1500 to 1700, so it is possible that there were versions of the mounted knight-vs.-bull spectacle in Spanish Naples, though I have not read that there were. In any event, bull fighting certainly was not practiced under the Bourbon dynasty that came to Naples in the 1730s. The article notes that Neapolitans had to wait out a quarantine due to a cholera outbreak in Spain, but that finally "...twelve Andalusian bulls, together with a large company of performers in the coming tragedy, soon arrived, and were received with a joyous welcome." The rest of the article is a long and anguished tirade against bull fighting, the kindest phrase of which is that it is "...a carnival of stupid cruelty." The 1890 episode—from the description in the paper—took place in the historic Piazza Mercato, a space large enough to accommodate such an event; indeed, it was also the site where Buffalo Bill had presented his Wild West show in January of that same year. 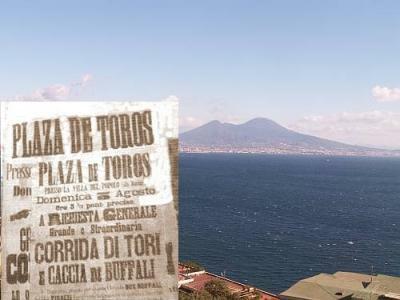 The Neapolitan bull fights continued for at least a few years but moved to a different location. The insert in the graphic (above) is a poster advertisement for such an event. Note the Spanish Plaza de Toros but, below that in Italian, Corrida di tori (bull fight, though corrida is borrowed from Spanish) and Caccia di buffali (buffalo hunt!—that has to be in imitation of the earlier Buffalo Bill show). An article from Il Mattino, the Neapolitan daily, of September 11, 1893, reports on the spectacle in the new hippodrome near the upper station of the Montesanto cable-car, an area that was then still largely countryside. In an age before mass spectator sports such as soccer, the new arena served for whatever you might get people to show up and pay for: a race-track for horses and bicycles—and, of course, bull fights. The tone of the article has none of the disapproval of the foreign press, cited above. It is light-hearted in the extreme, concluding that the day was one of "hilarity for all...except for the animals."